It is an elegant and comfortable guest-house situated in the heart of Naples at about 100 metres from Piazza Municipio, Molo Beverello (from which you can leave for Capri, Ischia, Procida, Sorrento), via Toledo, piazza del Plebiscito, San Carlo opera house, the Royal Palace and the main shopping area. The archaeological sites , the ancient Greek Naples and the Roman decumans are five minutes away. Spaccanapoli, San Gregorio Armeno, the Concert house, the Museo Archeologico Nazionale are all close at hand. From Piazza Municipio you can easily move to Pozzuoli, Baia and all other districts by public transport. Also the archaeological sites of Pompei and Ercolano are no more than half an hour distance by train. 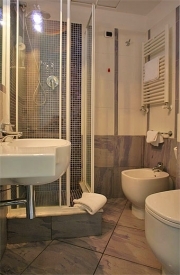 All rooms with bathrooms en-suite are elegant, spacious and well furnished with pieces produced by Neapolitan artisans. Some drawings of the well-known artist Riccardo D´Alisi decorate the walls. Those who search a Bed & Breakfast in Naples, will find a central, elegant and comfortable accommodation. The Fiorentini Residence also offers accommodation in very nice and new renovated apartments. The apartments are located in the most noble and central areas of Naples. From Piazza Municipio take Via Medina, walk about 100 metres and turn into the fourth street on the left by hotel Jolly. Five or 10 metres ahead you will find the sign of Fiorentini Residence. Use one of the two lifts to the seventh floor, "scala A". Lifts are free. If you come by car and need a garage, there are three or four around; one at the bottom of the building itself. If you come by air and land at Capodichino airport, apart from taxis you can take bus 3S or Alibus departing each 20minutes. If you come by car from the North or the South follow the signs to "zona porto", "Via Marina", "Piazza Municipio. A taxi stand is outside Jolly Hotel.